The Mayon Volcano encapsulates beauty and madness in its pure form. With its naturally gifted symmetrical form combined as being as one of the most active volcano in the country, this natural wonder can still be harnessed during its dark activity. With precise planning and proper distancing, even at the midst of its eruption, Mayon can still be regarded as a safe haven for nature enthusiasts. This is what the local government unit of the province of Albay is making sure to happen. Pre-emptive preparation through evacuation of nearby settlements to ensure zero casualty and designation of tourist spots that can be used as safe vantage points for the volcano in case it displays destructive yet amazing wonder through its eruption. 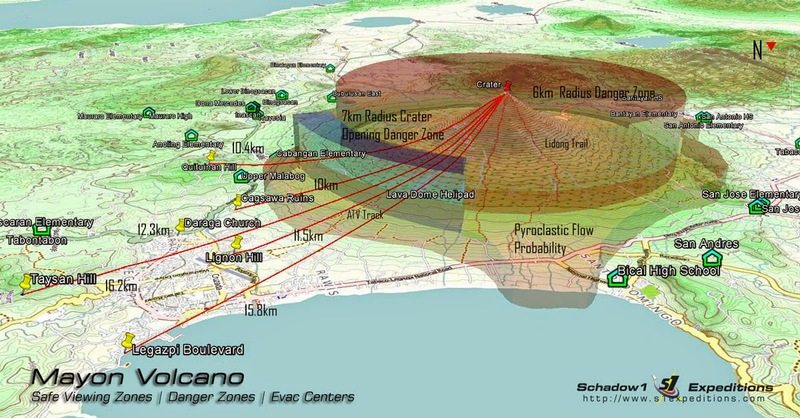 Schadow1 Expeditions has mapped the volcano last December 2012 for two reasons. First is to ensure that the tourist spots are specified while the roads and tracks leading to it are traced. Second is to ensure that trails going to the volcano are properly mapped for recreation, rescue, and disaster preparation. 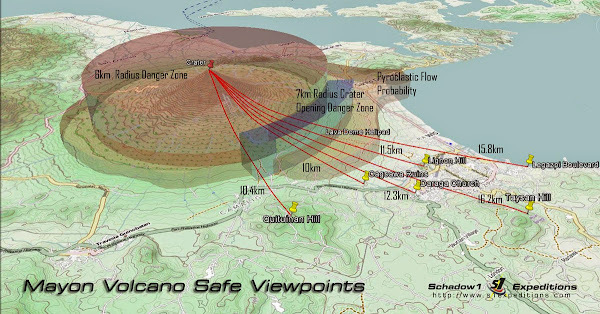 The graphics above is a result of our mapping expedition to the said volcano rendered on Openstreetmap Philippines basemap together with the danger zone data of PHIVOLCS and tourist spots designated by Albay's Provincial Disaster Coordination Center as safe zones. It also includes the evacuation centers to be used by its locals living within the 8-km danger zone. Mayon Volcano has been designated to have a permanent danger zone of about 6 kilometer radius from its crater with an extended 7 kilometer danger zone facing its southeast quadrant where the crater opening is directed to. An uneven area for pyroclastic flow probability has been plotted based on its 1864 eruption that reached Sto. Domingo on its record levels. Through the leadership of Albay Governor Joey Salceda, locals residing within 8-kilometer radius of Mayon Volcano has been evacuated to 45 evacuation centers located within the towns/cities of Guinobatan, Malilipot, Camalig, Ligao, Tabaco, Daraga and Sto. Domingo. Exact locations of the evacuation centers have been mapped at Openstreetmap Philippines and a map compatible with GPS-assisted navigation devices are regularly compiled by Schadow1 Expeditions and is available for free at our #mapPHL page. 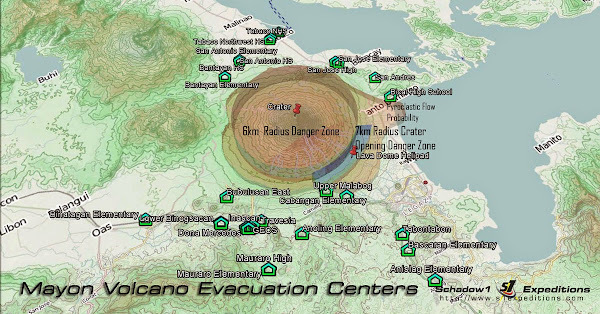 Evacuation points coordinates now available as a query on Openstreetmap here. Especially designated safe, non-hindered vantage points for tourists have been pointed out by the local government unit of Albay which include Lignon Hill, Cagsawa Ruins, Daraga Church, Legazpi Boulevard, Taysan Hills, and Quituinan Hills. The ATV to the Lava Dome unfortunately is within the 7-km danger zone. 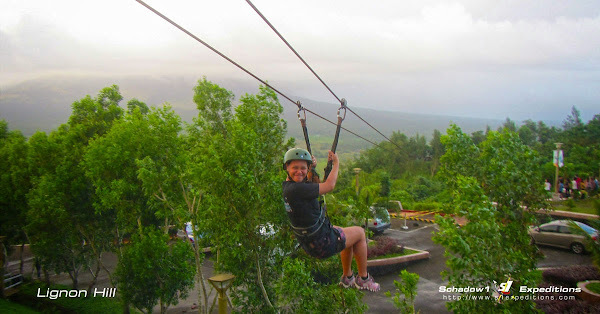 Lignon Hill is 11.5 kilometers away from Mayon and features an 150-meter elevated vantage point facing the southeast quadrant of the volcano which makes it as one of the most ideal angle when viewing the volcano during eruption while the glowing lava flows down from its slopes. 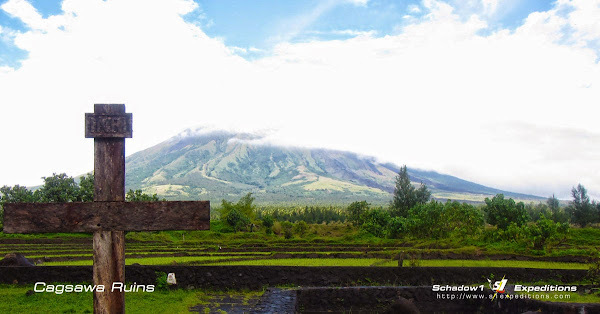 Cagsawa Ruins on the other hand is also one of the best vantage points being the nearest among the tourist spots that is still safe to be used for viewing the volcano on its southeast quadrant. Having being only 10 kilometers away from Mayon; and still way outside the 7-8 kilometer danger zone. 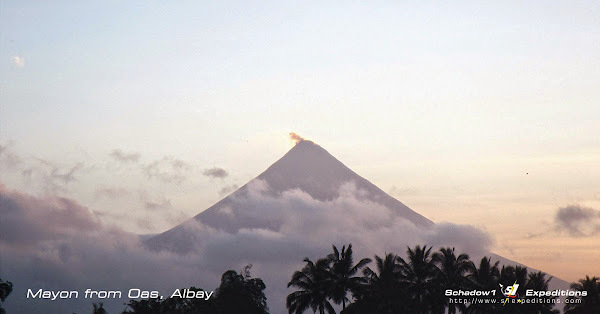 Legazpi Boulevard is located along the shores of Albay Gulf which gives a refreshing view of Mayon and the city. It is about 15.8 kilometers away from the volcano. Other locations include Daraga Church at 12.3km distance, Taysan Hills at 16.2km, and Quituinan Hills at 10.4km away from Mayon. Special thanks to Governor Joey Salceda and Renato Bryan Jao for providing the safe zones and evacuation centers data.